BERLIN (Reuters) – Chancellor Angela Merkel on Thursday accused the far-right Alternative for Germany (AfD) of using violent protests over a fatal stabbing blamed on migrants to stir up ethnic tension. Far-right groups clashed with police and chased people they deemed to be migrants in the eastern city of Chemnitz on Aug. 26 after police said a Syrian and an Iraqi had been detained as suspects in the killing of a 35-year-old German man. The protests in Chemnitz have set off a debate about whether politicians are being too complacent in the face of rising xenophobia in a country where many had thought the lessons of Germany’s Nazi history had been learned. Some in Germany blame Merkel’s liberal immigration policy for the rise of the AfD, which entered parliament for the first time in an election last year as the third-largest party. After the violence in Chemnitz, German politicians urged intelligence agencies to start monitoring the far-right party, some of whose members marched with supporters of the anti-Islam PEGIDA group in the city last weekend to protest the stabbing. The state intelligence agency in Thuringia on Thursday said it would examine whether the AfD’s state chapter was pursuing anti-constitutional goals, a possible step toward putting the group under official surveillance. 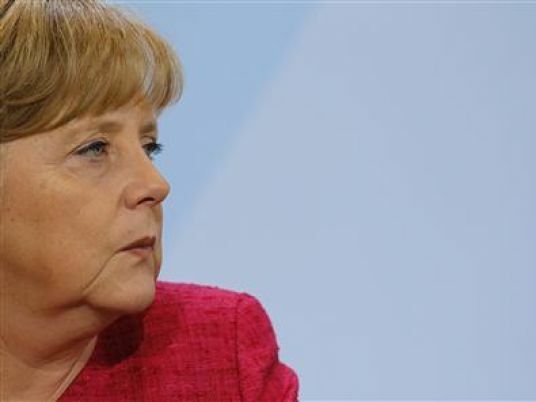 Merkel’s immigration policy has also caused a rift within her conservative bloc, which includes her Christian Democrats (CDU) and their Christian Social Union (CSU) Bavarian allies, that almost toppled her coalition government in June. Interior Minister and CSU leader Horst Seehofer had threatened to pull out of the coalition government over immigration. In an interview with the Rheinische Post published on Thursday, Seehofer said: “People are annoyed and outraged because of such homicides and I understand that. Seehofer has taken an increasingly hardline stance on immigration as his party tries to fight off a strong challenge from the AfD in October’s regional election in Bavaria. Additional reporting by Andreas Rinke and Hans-Edzard Busemann; Editing by Michelle Martin and Janet Lawrence.